There were less than two minutes to play and visiting Pahrump Valley was threatening to ruin Boulder City’s season opener at home with a first down inside the Eagles’ 10-yard line. Four plays later, the Eagles had answered their coach, and themselves. Senior Sam Woodbury intercepted fourth-and-goal pass in the end zone with 20.1 seconds remaining to preserve a 14-8 victory against the Trojans (1-2). 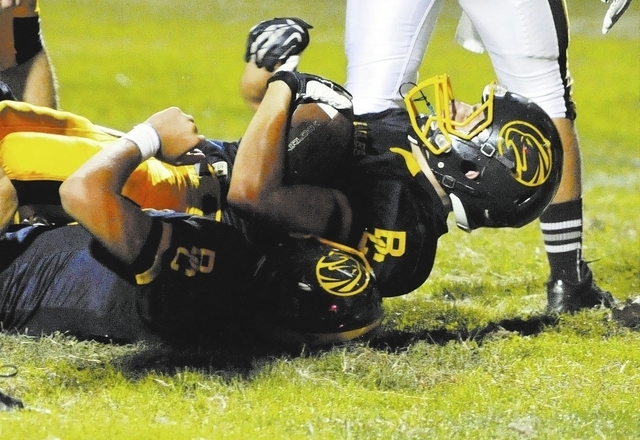 On the three previous plays, junior Trenton Carmell and junior Seth Kermode batted down passes in the end zone, and senior safety Xavier Steel made a tackle on an end sweep to stop Pahrump. “I told them that we put ourselves in a bad spot with mistakes and that we had to go out there and stop Pahrump’s drive, said Kazel, whose roster includes six seniors and 19 juniors. “No one else was coming to help us. We got into it and we had to find a way to get out. I told them to stand up and show me what kind of a team they were going to be. Woodbury’s play also kept the Eagles (2-1) from a bitter defeat in a game they dominated for more than 3½ quarters. Leading 14-0 with 5:22 to play in the game, Carmell threw an interception that gave the Trojans life. In a game that appeared all but over, Pahrump suddenly drove 62 yards for one touchdown and made a two-point conversion to cut the deficit to 14-8. The Trojans had stolen the game’s momentum and seemed poised to steal the game. Pahrump recovered the ensuing onside kick and quickly drove down the short field to the Eagles’ 9-yard line with 1:22 remaining and two timeouts. “It didn’t look good there for a while. I was upset after the interception pass and especially after the way they moved the ball so easy on two drives,” Carmell said. “Almost before we realized it, they were threatening to score the winning touchdown and leave no time on the clock. On each play of the final Trojans’ drive, an Eagles defender, who began the play standing in the end zone, stepped up and made a game-saving play. The Eagles’ offense started the game with a 16-play, 72-yard drive that consumed 10:22 of the opening 12-minute quarter. But the team failed to score despite a first-and-goal at the Trojans’ 4-yard line. The Eagles had a better second quarter. Woodbury had a 19-yard touchdown run and later added a two-point conversion run after Steel’s 1-yard scoring run to give the Eagles a 14-0 halftime lead. Junior Nelson Van Diest led with 57 yards rushing on 14 carries. Woodbury ended with 37 yards on five carries, while junior Brooks Roe had 25 yards on five carries. Steel, nursing a sore left calf muscle, had nine yards on eight carries. Carmell connected on 3 of 5 passes for 76 yards. His targets were Roe for 53 yards on two catches, and Woodbury for 23 yards on one catch. After playing two of its first three games of the season on the road, Boulder City goes back on the road to Faith Lutheran (2-2) at 7 p.m. Friday night. The Eagles beat the Crusaders twice in 2012 — once at home, 41-22, in the second game of the season, and then, 57-33, to open the region playoffs at home. In those two meetings, Eagles running back Steel ran for a combined 514 yards and six touchdowns. But Eagles coach Kazel now expects a different defense. Faith Lutheran’s new coach is former NFL defensive back Vernon Fox. Eagles fans can see their team back at home in its Sunrise League opener Sept. 27 against Desert Pines.